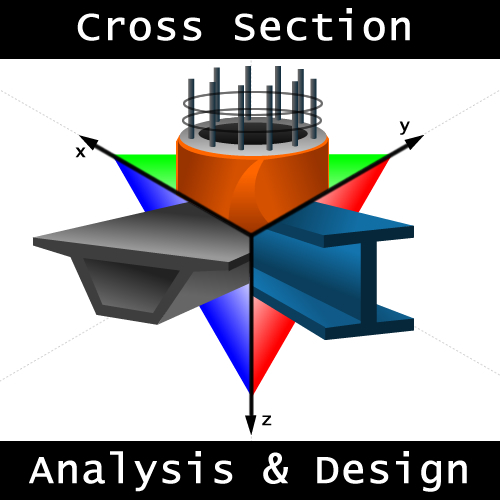 Cross Section Analysis & Design performs all cross section calculation tasks. Among the program’s capabilities are the calculation and illustration of Moment vs. Curvature graphs, interaction surfaces, stain distributions as well as stress contour plots. Moreover, reinforcement check or design options are also supported. The application fully complies with all major codes for reinforced concrete sections (AASHTO, UBC, AS 3600, IS 456, ACI 318, BS 8110, CSA A233, EC2, NZS 3101 and CP 65) but can also handle other user-defined materials (linear, bilinear, trilinear, parabolic or fully customized materials by providing a stress/strain curve). Cross Section Analysis & Design covers efficiently a design engineer’s everyday needs due to the program’s simplicity and the wide range of supported cases. Below you can find a series of worked examples for Cross Section Analysis & Design which can also be found in the application using the File -> Open sample project menu item. We have tried to include characteristic examples from an extended range of common cases in the field of concrete, steel and composite structures.